Summer is rapidly approaching, which means that the renting season will soon be in full gear. Historically, the rental markets begin to tighten around May, as new students and graduates begin work or school. Unfortunately, the fierce competition and higher prices also create the perfect conditions for unscrupulous posters to list scam units. Here at RentHop, we’ve developed several algorithmic (as well as manual) processes to verify listings that appear on the site. To this end, we’ve collected a ton of data over the years on suspicious listings and messages. As a renter, you’ll probably end up consulting several different online sources to find your place (which we encourage). Here are some tips to avoid getting scammed during the search. You’ve probably heard many of these tips before – but scammers are constantly evolving. The number one way to guard against scams is to follow your gut (and keep a healthy dose of skepticism). That’s not to say great deals aren’t around, but always be wary of situations where the other party is being particularly sketchy. Western Union is a cesspool of scams, money laundry, and wire fraud. That’s not surprising since they recently admitted as such to the Department of Justice. Similar services are no better. If Western Union, MoneyGram, or an “escrow” service is mentioned at all in your interactions with the “owner”, you can immediately write off the apartment. The apartment doesn’t exist, and you’re probably talking to a guy in Nigeria. We process tens of thousands of messages between renters and owners daily. We’ve never seen an instance where one of these payment methods is preferred. Even if you’re on the most reputable site, talking to the most reputable property manager/agent, you should be suspicious. Old-school scammers might create accounts on apartment search website to post their fakes. Newer, more sophisticated ones might hijack real accounts (via phishing schemes) and use those. They might even send you a phishing-style email from an official-looking website (ex: carbon copy of a fake PayPal website) for your information. Scam Level: Swimming with hungry piranhas (you probably won’t get out unscathed). Always arrange to see an apartment before sending money. Scammers will try to create a sense of pressure by mentioning other “interested parties.” They might tell you that they’re out of town and can’t show the apartment. They might even have an elaborately crafted story about being an overseas missionary. No matter what the owner tells you, always be on the highest alert if the owner is being evasive about scheduling a showing. 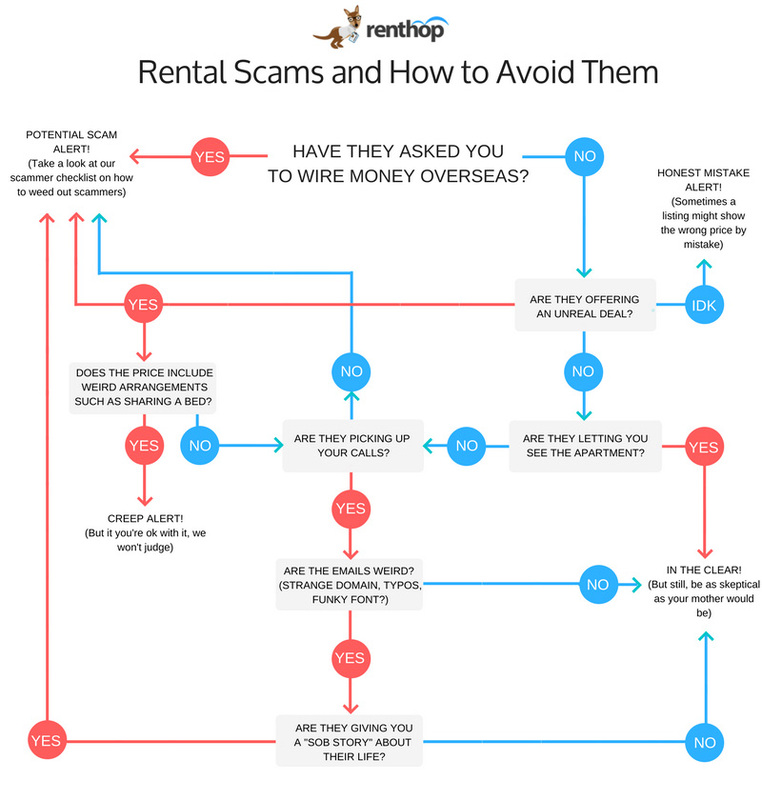 Be extra careful about wiring money. Wiring money to someone you don’t know is risky in general. Wiring money internationally (if you’re a US resident) is even more dangerous. Many individual owners are fine taking a personal check (provided it clears before the key transfer). Larger landlords and property managers will probably charge you a small application fee between $20 and $100 dollars to hold an apartment temporarily (which you can pay with credit). Eventually, you’ll end up bringing cashier’s checks to their leasing office or mailing it to their physical US location. If you’re moving from out of town (or overseas), you’ll need to be extra careful throughout your search. In fact, you’re probably the prime target of most scam attempts. In these cases, you’ll be best off paying extra to work with a reputable property manager or real estate agent. What makes a property manager/real estate agent reputable? The company or their website has been mentioned by news outlets, blogs, etc. If the price is below 2/3 of what similar apartments in the area are renting for, there is a 43% chance that it is a scam. If it is below half, then there is a 79% chance that it is a scam. Most apartments (assuming the same size, location, and amenity set) will fall within the same price range. We’ve found that nearly 75% of apartments will be within 15% of the median. On the lower end, the number of legit apartments quickly decreases as you get cheaper than 15%. This relationship doesn’t hold on the upper end (as prices increase) since very high-end rentals exist. You can always refer to our rental stats and trends page to get a sense of how much apartments in the area are going to cost. If you’re moving from a more affordable part of the country to someplace like NYC or San Francisco, be prepared for sticker shock (i.e., don’t expect rents to be at all similar). More sophisticated scammers might use emails from their own domains. Whenever you’re confronted by a domain you’ve never seen before, always try visiting the domain and searching for it on Google. Be extra careful if the domain isn’t hosting a website or you can’t find it on Google. Sometimes, scammers might try to make you feel special. If you get congratulated, are “specially selected”, or won some lottery, the listing is probably a scam. In 92% of cases where we’ve detected such language, the listing turned out to be fake. Did you get a very lengthy story (along with details on how to send money) from the poster? Getting a response back longer than 250 words should immediately raise red flags. Scammers might also try to play on your emotions by telling you that they had to give up on the apartment due to unforeseen circumstances. The longer the response, the more you should be concerned. Can you rent the apartment for any length of time? Are they allowing 1-month leases as well as full-year leases? Is there a discount for putting in a larger deposit? No normal apartment owner/property manager does this. The listing is probably fake. You should always search for the address of the apartment that’s posted. If the prices that you see online are way different from the prices that the poster quoted, it’s probably a scam. You might even want to contact the property manager or other people who are listing a similar unit in the same building to cross-reference the price. Did you email one person (maybe someone with an email from a legitimate domain), but get a reply from a different email domain? Did the person try to move the conversation off the platform you contacted them on? Experiencing this doesn’t necessarily mean that you’re dealing with a scammer. However, you should be a little bit more suspicious. Historically, these are the three most popular fake professions by old-school 1.0 scammers. More sophisticated scammers will attempt identity theft of a reputable owner or real estate agent (by copying their online profiles directly). Don’t just search names, search on Google for the domain names and street addresses. Just because you get sent official looking documentation doesn’t mean that it’s real. License numbers/cards, applications, deeds, are all available online publicly. Scammers will go to great lengths to create fake passports and license certificates. If the person you’re dealing with is over-eager to send photos of their official documentation (passport, license, etc. ), they might be scammers. Most people are pretty private, and won’t want to reveal this information. Be on the lookout for non-matching fonts, uneven fonts, or strange blurring effects in documents (to detect photo editing). Finding an apartment is already hard enough. Adding the possibility of getting scammed into the mix makes it even harder. As we’re approaching a season where everyone is getting desperate to find an apartment, be smart and realistic. Look at who’s approaching you, look at the deal, and look to see if you can find any of the warning signs mentioned in the article before you sign a lease or wire any money over to anyone. Happy apartment hunting!